This morning I am in awe of the immensity of God. Never mind that in my mind I know the fact that He is limitless – today my heart has captured it in a fresh way. This is a centuries-old supernova remnant. Its rose-tinted shock wave is blasting outward at more than 11 million miles an hour. 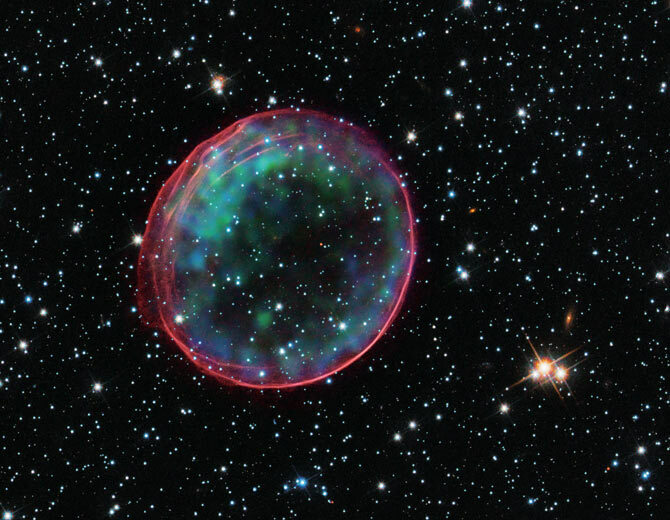 It hangs in the Large Magellanic Cloud orbiting the Milky Way like an iridescent holiday ornament. When I read the description of this picture, and saw that for several hundred years the shock wave of this exploding star has been travelling at 11 million miles an hour I was blown away. My mind cannot comprehend how big the universe is that God created and He holds in the palm of His hand. For example, let’s just randomly assign an explosion time of 200 years ago; it could be older than that. Let’s see – 24 hours in a day times 365 days in a year times 200 years equals one million seven hundred fifty two thousand hours. That means the rose-tinted ring has already traveled over 19 trillion miles. Yet when you look at the picture, the ring has not yet reached the nearest neighbor stars. The heavens truly declare the glory of the Lord. This is really significant today as we consider the closing verses of Isaiah fifty-five. They put a cap on several chapters of Messianic promises concerning the restoration of Jerusalem after its abandonment and destruction caused by the people’s sins which led them into captivity. God says that the day is coming when the people will return to the city in renewed glory, and when they do they will go out in joy be led forth in peace. Everything in nature will burst forth into praise to the Lord, and what had once been a land filled with thorns and thistles will now be a land of productivity and promise. As I thought about that, and looked at the picture again, I realized that the thorns and thistles of my life that are so burdensome to me are less than specks to an awesome God who holds the universe in His hands. The problems of my life are not worthy to be compared to the glory that will be revealed in me when Jesus returns. We have the certain hope – the guarantee of God – that everything we consider hardship right now will be replaced with joy and peace when God finishes His work in us. Just think – God’s Star exploded on earth 2000 years ago. The shockwave of His glory is filling the earth. You can see it. You can know it. You can live in it. Let everything in your life come under its influence. Don’t let the thorns and thistles speak. Instead, let every part of your life burst into song – Joy to the world, the Lord has come! After all, God is bigger than any problem you have. This is straight up my alley right now. You should see the Universe book Jamison got for Christmas! We sit there with mouths open in awe of God as we look at the expanse of the universe. He is amazing!